We have a gorgeous family room with a gorgeous, massive stone wall rising up to meet the 20-foot ceiling and dominating the whole look and feel of the space. I absolutely love that wall. 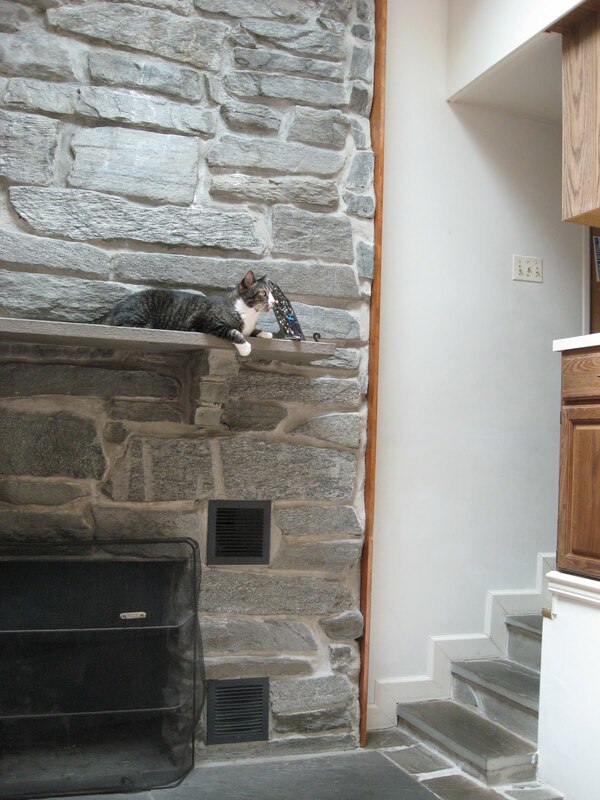 The wall also houses a beautiful fireplace, which we used a few times over the winter. Here’s a look at the wall. It’s a shot from Animal’s growing modeling portfolio. Beautiful, right? It’s where we hang out every night, where we eat dinner at our TV tables because we’re not real grownups yet, and it’s our favorite room in the house. A big hole in the rock wall, where we burned stuff. The contraption across the bottom of the doors is a fancy fireplace thing called a grate heater, which lets us keep the doors closed with the fire going while a fan inside circulates the air out to us to keep us warm. This eliminates the problem of all the warm air in the house rising up the chimney and leaving us huddled in blankets wondering why we’re cold by the fire. It was a lot more expensive, mostly because we needed to upgrade the glass in the doors to something called pyroceramic glass, which can withstand the intense heat from the enclosed fire. We still have the option of leaving the doors open and the fan off, and just having a normal open fire, so we can enjoy the festive crackles and sparks. But because this room has such high ceilings and only a 5-foot section of baseboard heat, it’s a very cold room in the winter, so having this grate heater will make a world of difference and will make it that much more fun to hang out in that room and watch TV. It’s 90 degrees out today, so we won’t be testing it out for quite a while, but I think it improves the look of the room and I’m really excited about it! Can’t wait to have it in action next winter! This entry was posted in Uncategorized on July 1, 2011 by antijen. I was wondering – did you hire a general contractor for the estimate, or did you find someone who specializes in fireplaces? We are looking to remodel the fireplace in a home and I am finding it difficult to locate someone who really specializes in fireplace/fireplace code. I’m not in your area, I am just curious as to whether it was a general contractor or specialist. 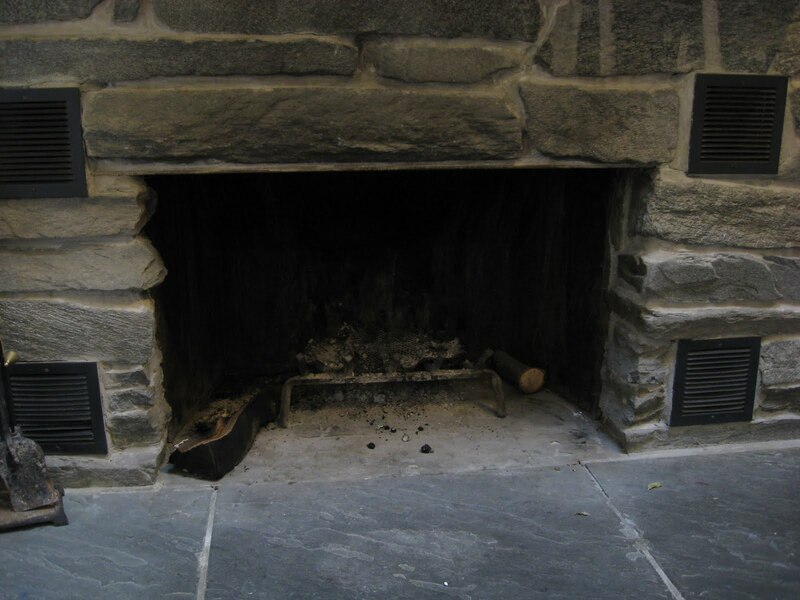 I was also drawn to your photo specifically because of those side openings – our fireplace has those too and I’m having a hard time understanding what they’re for, and I have found so few photos that have them. Thanks for the post!!! The side openings are a heat recirculating system – a fan pulls air in through the bottom squares, and as the air passes through the duct on its way back out the top square, it’s heated by the hot metal side of the fire box itself. The air duct doesn’t connect to the fireplace, to no smoke gets out. We didn’t think it worked very well, frankly, which is why we went with the grate heater. 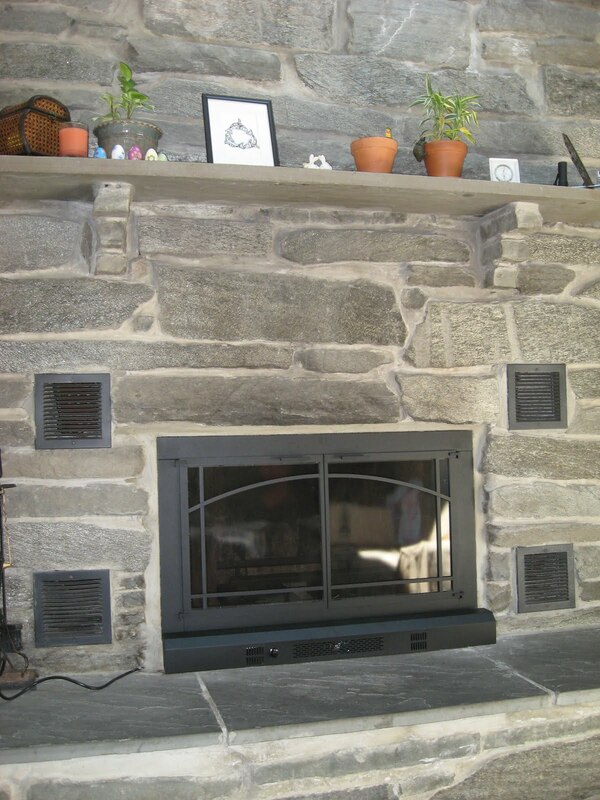 We used a company called Fireside Stone and Patio, which specializes in fireplaces and outdoor fire pits. I’m sure that if you look up fireplace designs online you’ll be able to ask the company whether there are licensed vendors/contractors for their product in your area. For example, we started by looking at Stoll doors, and then followed links on their site: https://www.stollfireplace.com/store/dealers Hope this helps you!